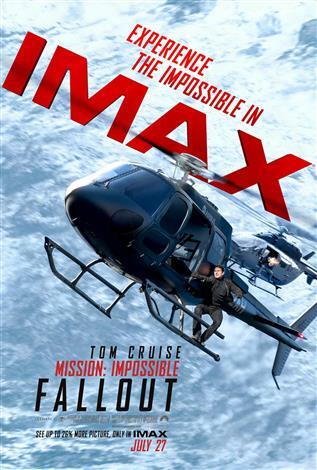 The IMAX release of Mission: Impossible Fallout will be digitally re-mastered into the image and sound quality of The IMAX Experience® with proprietary IMAX DMR® (Digital Re-mastering) technology. The crystal-clear images coupled with IMAX's customized theatre geometry and powerful digital audio create a unique environment that will make audiences feel as if they are in the movie. The best intentions often come back to haunt you. MISSION: IMPOSSIBLE - FALLOUT finds Ethan Hunt (Tom Cruise) and his IMF team (Alec Baldwin, Simon Pegg, Ving Rhames) along with some familiar allies (Rebecca Ferguson, Michelle Monaghan) in a race against time after a mission gone wrong. Henry Cavill, Angela Bassett, and Vanessa Kirby also join the dynamic cast with filmmaker Christopher McQuarrie returning to the helm.